A stunningly beautiful fish, the canary rockfish has white skin that is mottled with copper and gold tones. Fillets are deliciously tender and delicate, making the canary rockfish a sweet delicacy that will add charm to your menu and provide elegant entrees for your customers to enjoy. Gently steaming the white fillets will bring out the delicate nutty flavor of the canary rockfish. The meat is excellently suited to baking with butter and sprinkled with herbs and seasoning. Your chef may choose to dip fillets in batter and pan-fry to serve with tangy sauces, or poach the rockfish and serve it with fresh vegetables. Any way you choose to add this fish to your menu, your customers are sure leave satisfied and enticed to return for more. Similar to other rockfish, canary rockfish are long lived – up to 100 years – and are very slow-growing. This makes them vulnerable to overfishing and the population of Puget Sound has been declared threatened. However, management and fishing methods have vastly improved in the last few years and all rockfish populations are recovering and rising. Any species caught with bottom trawling should be avoided, as this method can destroy sensitive seafloor habitats and create high amounts of bycatch. Many canary rockfish are caught with handlines, a much more sustainable method. We believe in providing our clients with delicious and healthy seafood while respecting our natural resources. Pucci Foods is a Marine Stewardship Council certified seafood distributor and you can trust that our seafood products help promote healthy oceans. Buy your wholesale seafood from us and join us in creating sustainability for the future. 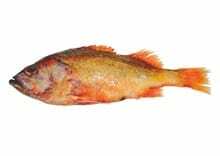 Order your wholesale canary rockfish by filling out the form on this page and we’ll be in touch right away.